Stylish chairs and unique chair designs that will spice up your home or office and impress your friends. This recliner chair encourages good posture when sitting and is probably the closest you will ever get to experiencing zero gravity. Stylish modern chair design by Italian designer Luca Nichetto. 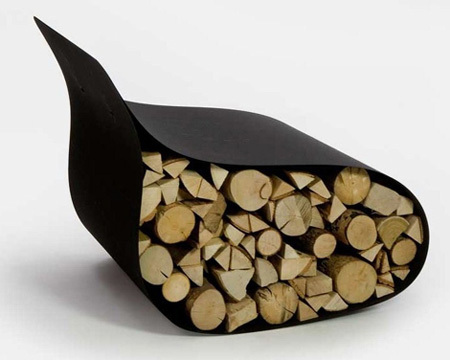 Sheet of steel curves around your firewood to resemble a chair. 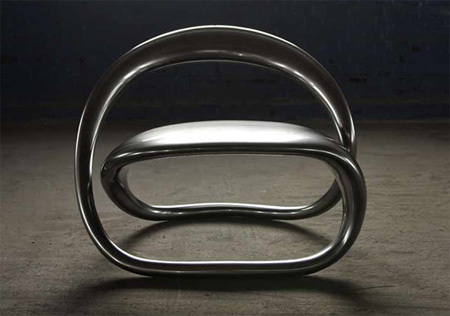 Continuous morphing polished aluminium loop in the form of a chair. 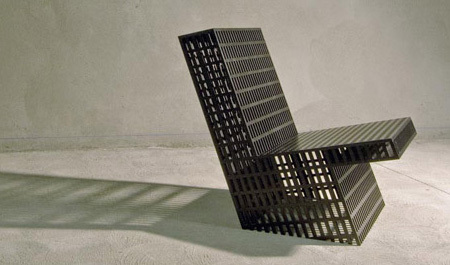 Triangular planes meet dynamically to create this stylish chair. 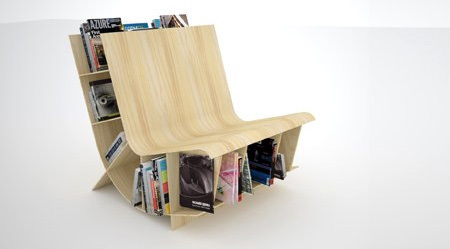 Brilliant combination of a chair and a bookshelf saves space and creates a perfect place for reading. Elegant chair concept designed by Svilen Gamolov from Bulgaria. Stylish combination of a mattress, chair and a couch designed for the Mungo Park theatre. 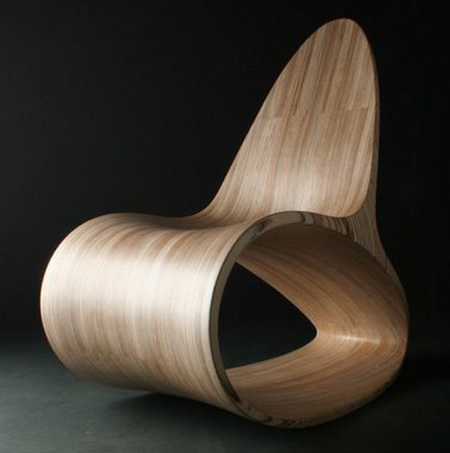 Contemporary chair hand crafted from wood by Jolyon Yates. Creative dress connects to shoes that pump air into an inflatable bubble. 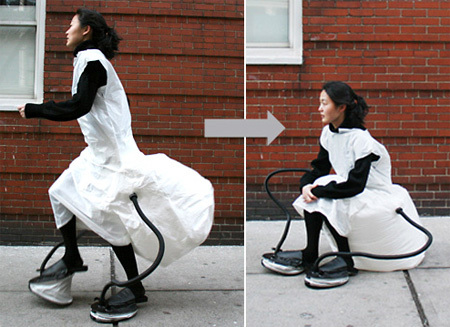 With each step, the dress slowly transforms into a chair. Elegant minimalist chair designed by Mehtap Obuz for ilio. 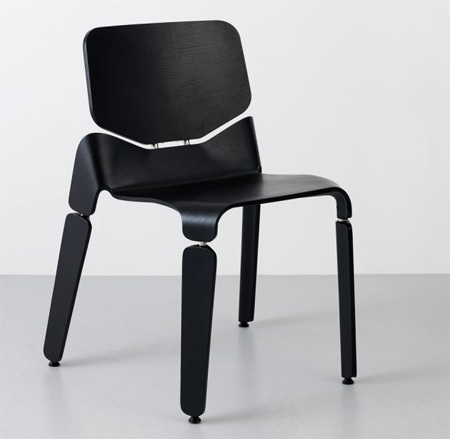 Beautiful and stylish chair designed by Christian Flindt. Cool chair made from a single laser cut sheet of 12mm plywood and 144 dowels with no metal connections. 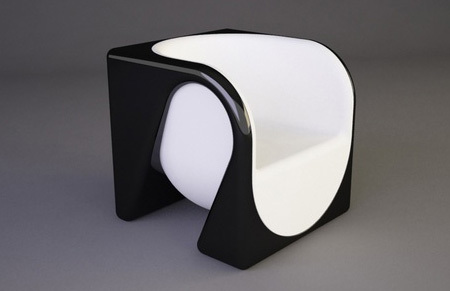 Modern chair designed by Sylvia Colombini and Zoran Jedrejcic merges the boundaries between art and furniture. 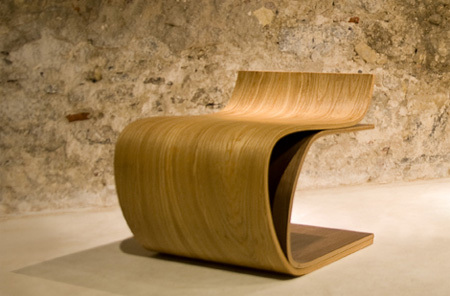 Wow.. that self sustainable chair is just…wow. I think I’ll pass on that one. 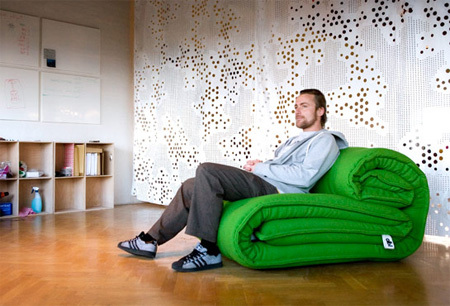 The self sustainable chair is genius, dispite being something ridiculous that no one would ever use it. I think it would qualify as a chindogu. The self sustaining chair is really the worst design I’ve seen on this site … ever. who would want to go around looking like that? The book shelf chair gets my vote! Although, it could use some arms or sides so I could curl up with one of my books, on the chair. Haha, self sustainable is just hilarious. The Zero Gravity one is pretty damn scary as well. Great stuff though! the book shelf one would be fantastic with some leather padding and an arm. lol – self-sustainable chair, only for very, very short sits: she had to end the phone call quickly as she was rapidly descending towards the pavement!! Methinks the design has a leak …. 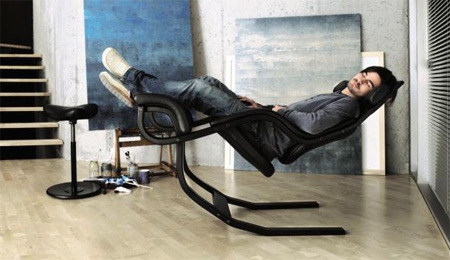 I like the ZERO Gravity chair.. Where can i buy it..
wtf @ the Self-Substainable Chair. Eklipse chair ftw :), and The Cube is niiiiiice. More like self image-tarnishing chair. wow. That Myrkr chair is a stunning design. Self-sustainable chair girl should take notes. Picture 1 – She looks like she’s struggling to walk. Picture 2 – She’s obviously using the bathroom. Picture 3 – She quit the photo shoot and is desperate to get a ride home before anyone else sees her in that giant inflatable diaper. Zero gravity chair got my vote. i think the zero gravity chair is awesome but the self sustainable chair is unusual i mean who would want to use that. and the fire wood and the book chair are nice. must have zero gravity chair now!!!! I vote for the zero gravity chair. No comment on the self sustainable…thing. .. so, vote for Roulade Chair…. Zero Gravity Recliner on sale for only $1,995.00! No thanks. (Zero) Gravity has been around for some time now. Sold ours couple of years ago *sigh*; it just took too many square metres of livingroom. It was a wonderful chair though (and after a couple of days you learn how to fall asleep in it, easily)! I like the zero gravity chair, but I wonder you do you actually manage to get into that position without rolling upside down. Besides, when you are sitting normally the base sticks out too much — anybody walking around you should be careful! i dont know one person who wouldnt pop that self sustainable chair if they someone wearing it. plaus, its just so, so impractical. i like the zero graviry chair :) but how do you not fall off when getting on and off?